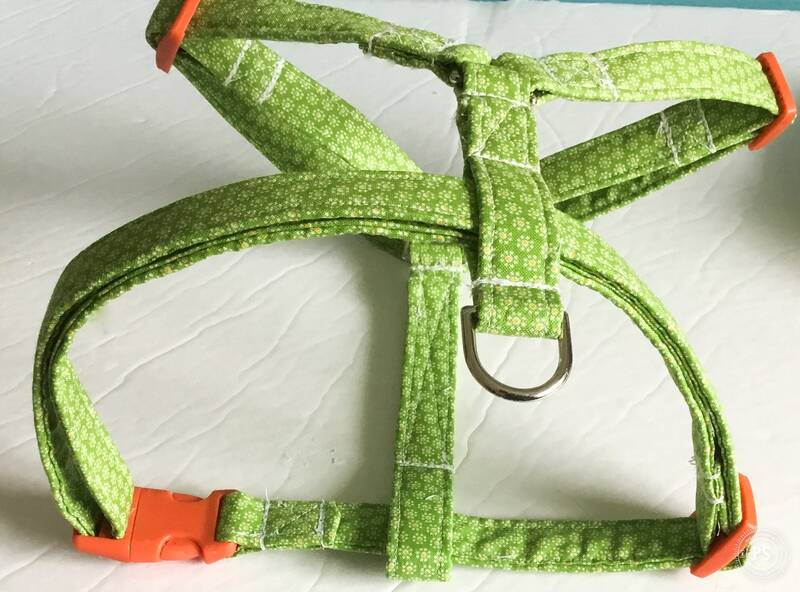 This listing is for a Spring and Summer Adjustable Light Green Floral Roman Dog Harness. Orange collar hardware has been used on this harness. To order this harness, you will need to measure your dogs girth. If your pup’s girth measurement is close to the end of the sizing on one of the options, please select the next size up. Please view the “Measuring Girth” image for proper measurement of your dog’s girth prior to ordering to ensure a correct fit. All harnesses can be purchased in size options including XS, S, M and Large. Each size allows for adjusting up and down when you place it on your pet by way of the slide adjusters. The slide adjusters are on the side straps and on the chest strap. A MATCHING FLOWER, BOWTIE, AND OR 5 FT LEASH CAN BE PURCHASED IN THE OPTIONS WHEN ORDERING. Custom orders are accepted for harnesses. Please feel free to contact me if you are looking for a specific fabric which you do not see in my shop. All Roman Harnesses are made from fabric and interfacing which is wrapped around Medium Weight Polypropylene Webbing for added long lasting strength and durability of the harness. Heavy duty hardware is used when making each harness. The hardware includes a curved plastic buckle, metal D rings and Slide adjusters. All stitching is reinforced for added security to prevent ripping. Please measure your pup’s girth as shown in the 4th image attached. You will want to start on the top of your pup’s back in the middle of his or her spine & move the tape measurement down behind one of your pup’s front paw’s circling under the chest and behind the 2nd front paw. Continue circling up to where you started. Do not measure tightly. All harnesses can be machine washed delicate cycle. Lay flat to dry or dry on low heat.